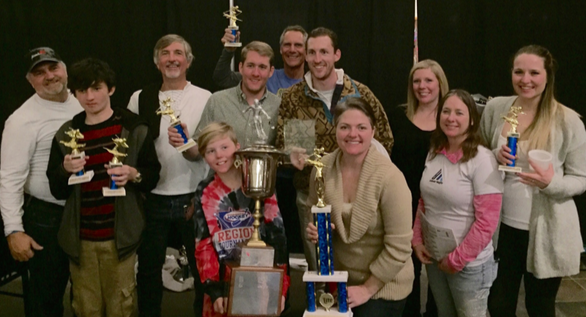 The Charlotte Ski and Snowboard Club’s racing team is open to all club members, skiers and snowboarders, regardless of age or ability. Whether you are new to skiing or snowboarding or you are an Olympic-caliber racer, the racing team wants you. Charlotte’s racing roster literally spans 3 generations. And while the roster is mainly comprised of average skiers looking to make the local mountains a little more exciting, the roster also includes several former collegiate ski racers and ski instructors and a growing number of snowboarders too. The club’s race team mainly competes in the Crescent Ski Council Racing Series against our 21 sister clubs scattered throughout the SE. 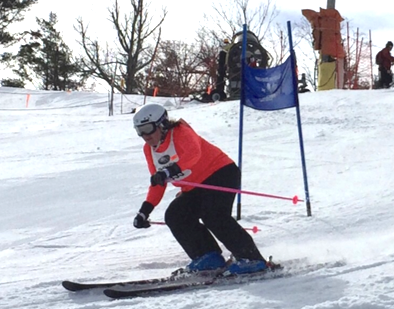 Racers must first establish a handicap by either competing in a Crescent Ski Council Race or racing at any resort that offers NASTAR racing. Once a racer obtains a handicap, he or she is grouped into a ‘flight’ based on their individual handicap. This racing format ensures racers only compete against those of the same ability. The top 3 racers of each flight are presented with awards at the end of the day. Points are scored over the course of the season and the top point scoring male and female both win an all-expenses paid trip to Steamboat Springs, CO! In addition to the numerous pre-season training camps on the schedule, the club’s racing team offers several opportunities to practice racing gates throughout the year. Every Friday evening before a local race (one near Boone, NC), a course is set up at Appalachian Ski Mountain. Racers receive a discounted lift ticket and pay a small fee to run the course for several hours. At Sugar Mountain Resort, racers may also pay a small fee to complete 2 training runs on their NASTAR course. The racing season begins in early December and can last through March. Several racers choose to compete in every race but this is not an expectation or the norm. Some racers register for Saturdays only, others only attend races at their favorite mountains. There is no minimum commitment needed to be a member of the racing team; compete only as your schedule and budget allow. If you are interested in the racing team or have questions please attend an upcoming membership meeting or contact the racing team director at the email address or phone number provided below.